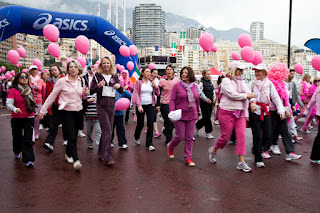 Following on from yesterday's post and the start of the 10 kilometre run, these 250+ ladies immediately followed in a blaze of pink for a leisurely 3 kilometre walk. Much more my style... They simply walked along the port, through the tunnel to Fontvieille, did a circuit around and then back to the port and all in aid on Monaco's first Pink Ribbon Walk for breast cancer awareness. And then many of them went off for a champagne lunch! You can see what a dull old day it was and boy did they brighten things up. Thanks for the photos, Jilly. Such a shame that Monaco, made famous by its sensational princesses, was not represented by a single female member of the Princely Family in this hallmark event. This is a cause that would be such an appropriate one for the princesses to support. 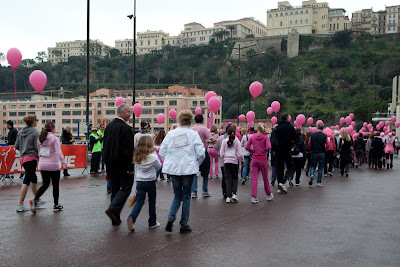 Especially since it is the inaugural event, this walk would have benefited greatly from the publicity that the presence of Princesses Charlene, Caroline and Stephanie and the younger ladies would have generated. Nonetheless, congratulations to all those behind the walk and its participants. I'm not really happy about replying to an anonymous person! Happy to get anonymous comments in terms of the way they are posted, but perhaps sign your name if you wouldn't mind in future. First name only is fine or initials. Thanks a lot. But yes I too heard that the new princess had been invited and hadn't even responded. Let's hope she will appear next year alongside her husband, Prince Albert, who was there to award the prizes to the winners of the 10 k run. They could have shared a car, after all! Thanks for the comment, anon. 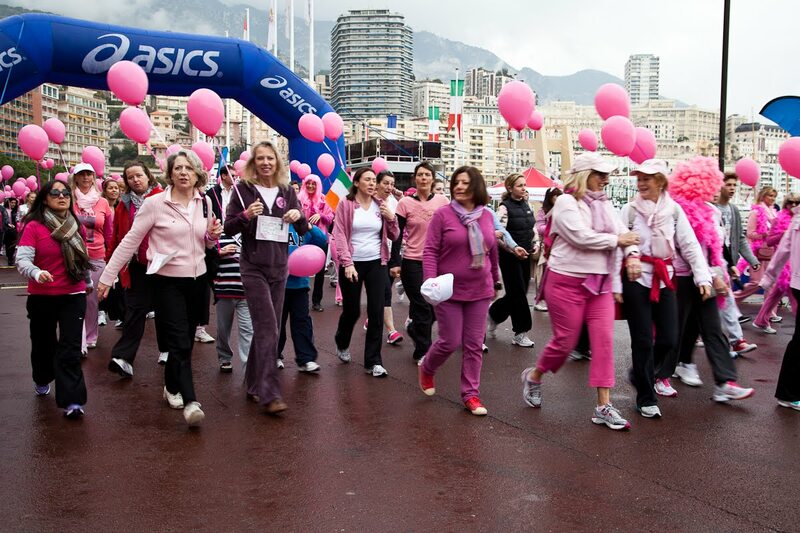 It's important to note that many women participated for a cause that has taken on its own celebrity in cities around the world. The presence of the princesses would have been nice, but leave them to their own decisions. They really are not needed when so many others recognize that women's health is critical. Looks like all the participants had a good time as they called attention to a critical problem affecting too many women. 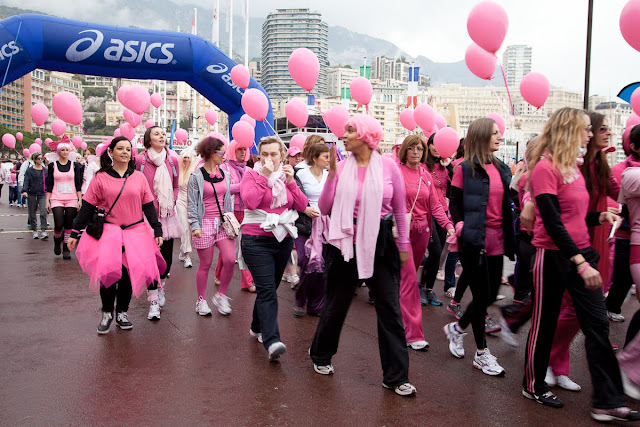 Pink praises for all the walkers!! Very good point, Kate. I'd forgotten that this is a world wide event now. It certainly is, and yours will grow and grow. Ours had 64,000 registered participants last June and this ain't exactly a big metropolis. Go back every year and show us what happens.